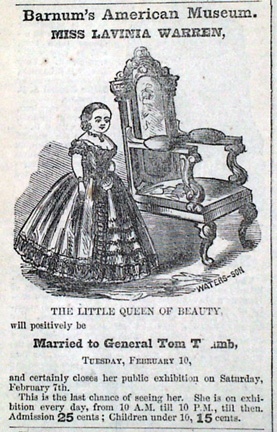 General Tom Thumb, born Charles Sherwood Stratton, was already an international sensation even before his celebrated New York City marriage. Three-foot tall Tom had toured the world with P.T. Barnum, who taught him how to sing, dance, and perform when he was a kid. On February 10, 1863, Tom, 25, married 20-year-old Lavinia Warren, also part of P.T. Barnum’s traveling sideshow. 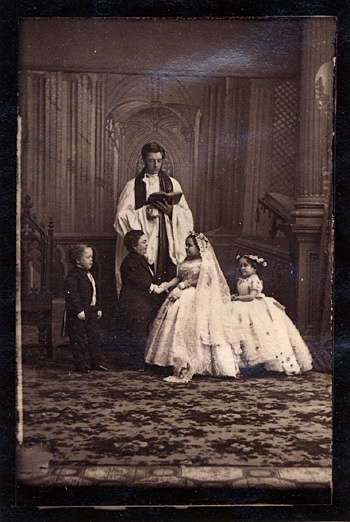 The wedding took place at Grace Church on Broadway and East 10th Street; the reception held at the Metropolitan Hotel, down Broadway on Prince Street. Barnum milked the nuptials as best as he could. He sold tickets to the reception for $75 a head, displayed Lavinia’s hand-made wedding dress in a department store window, and hawked souvenir trinkets. Tom and Lavinia continued to tour with Barnum. They had no kids (much to Barnum’s chagrin), and the marriage lasted until Tom died of a stroke in 1883. This entry was posted on May 6, 2009 at 3:38 am and is filed under East Village, Houses of worship, Lower Manhattan, Music, art, theater, Union Square. You can follow any responses to this entry through the RSS 2.0 feed. You can leave a response, or trackback from your own site. I’m the guy who looks like Abe Relis (ex-bell hop from the Carter). Just wanted to say thanks for this story about General Tom Thumb. Being a little person myself I wanna say it means a lot to people like me that you include us in your blog. We often go over looked. I’m gonna be sure to tell em all about E.N.Y. at the next L.P.A. convention (www.lpaonline.org/mc/page.do). Incidentally, did General Thumb serve in the Civil War?